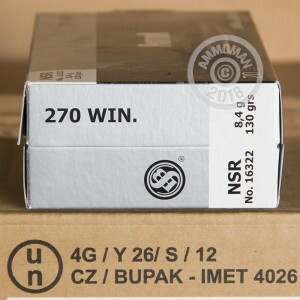 This Sellier & Bellot 270 Win features the premium Nosler Partition projectile. 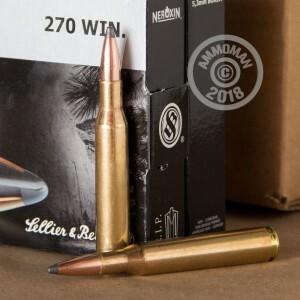 The addition of this projectile on the accurate Sellier & Bellot 270 Win round makes this a great choice for deer hunting season. The Partition projectile, by Nosler, has a two piece bonded lead core, separated by a copper partition. This projectile also has a copper jacket and a soft point, and has a muzzle velocity of 2800 feet per second. It has a reloadable brass case, is non-corrosive, and is boxer primed for reliable ignition. This excellent round will result in a quick and lethal kill, so you don't have to track your game through the woods. Sellier & Bellot has been producing ammo since 1825, and has been gaining popularity with American gun owners, because of their consistency and quality. In 2009 Sellier & Bellot became a member of the CBC Group which includes Magtech.